I had a sleepless night. My joints were aching, a sign that the weather was changing. Sure enough when dawn arrived the fog was so thick the condensation was like rain on my tent. I went out at 5am just to see if the wolf was there and check how socked in we were. There would be no photos for a few hours at least. I made breakfast, worked on my journal and organized my gear for a wet day. 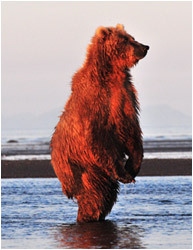 The bears were out on the beach but fishing was minimal and most were just sleeping on the sandbars. 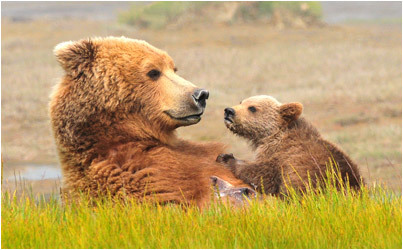 The fog was lifting slowly and it seemed the best idea was to visit Melissa and the cubs. 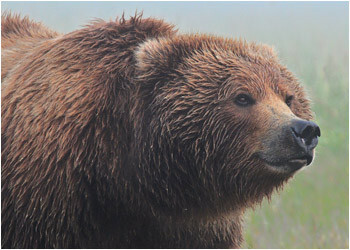 Better to shoot bears in poor light than sit in a drippy camp. We found her grazing in a meadow right in front of Hallo Glacier. The cubs played and she was even more comfortable with our presence than ever. She was quite happy to turn her back on us and let the cubs get closer. Scrappy, the precocious one sniffed the air and walked directly over to us. He clearly wanted to check us out and was just about close enough to sniff the camera tripod. The cameraman kept trying to shoo him away with his foot but he was extremely curious. Melissa looked up nonchalantly and went back to grazing. The only real danger in this situation is if another bear especially male were to suddenly appear. Then things could get a little hectic. As fate would have it a young ‘teenage’ bear crossed the river and sent the whole scene into a flurry. Melissa huffed a warning to her cubs and they ran back to her (oh thank god) and climbed all over her for security. 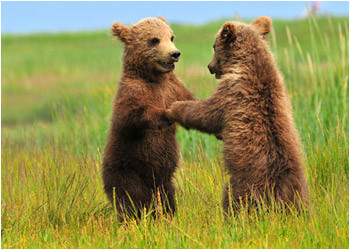 She repeatedly stood on her hind legs to see what the other bear was about and to intimidate him. She hustled the cubs away and kept looking back to make sure the boar was not following. He did not pursue her, but rather took an interest in what we were up to. 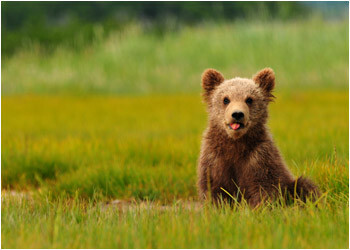 These teenage bears swagger and get quite arrogant but are really not that brave. This guy thought he would waltz right into our group, but Kent would have no part of it. From years of experience he recognized that this bear was showing fake bravado. Much to our surprise Kent got up with unlit flare in hand and charged at the bear. 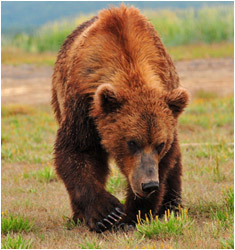 The expression on the bears face was of total shock and he spun on his heels and ran. Kent did not retreat until the bear was well on his way. I was too mesmerized by the activity to keep shooting, but the film crew caught it all on tape. They now call Kent the ‘Mad Swede’ and promise to give him a credit in the movie. We gave Melissa a chance to get comfortable again in the next meadow and then repositioned ourselves for the next act. By now the fog had lifted considerably and the surrounding mountains were becoming visible. She and the cubs went for a drink at the stream and then she came back up and lay down in front of us and nursed the cubs. The babies sounded like two lawn mowers, their purring so loud as they suckled. Then everyone (including the film crew) laid down for a 20 minute nap. They told me to keep watch and let them know if she moved. I said sure but I want a credit too for being on nap patrol! It was testament to Melissa’s trust in us that she went to sleep on the stream bank with her back to us and her eyes on the stream ahead of her. After their nap the cubs played some more and then the family crossed the stream and headed for the woods. We made the long trek back to camp completely elated with the morning shoot. The film crew was running low on batteries, and since the Kittiwake was back in Hallo Bay, we were ferried on board for a brief stay. Time enough just to shower, build a sandwich, charge batteries and download images, then back to shore for the evening shoot. At about 9pm the action started in earnest with 6 bears out on the flats fishing. Well actually Bandit was sleeping and the girls were fishing. Paula was very active and I managed to capture her standing up and doing a quarter turn on one leg – like an 800 pound ballerina! Since the low tide was getting later each night it meant a shorter time for shooting and it wasn’t long before the light was gone. The guys busied themselves talking shop, but I wandered around the sand bars looking for the right place to shoot the setting sun. 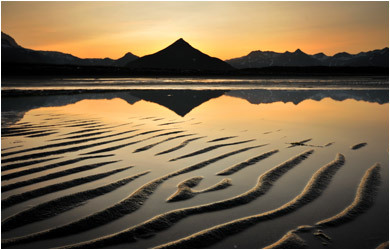 The sun had just gone behind Kukak Volcano and I found a quiet little reflecting pool with fascinating patterns in the sand. The only way to compose the shot was to get down into the muck on my belly. I lay flat out in the puddle on and started shooting, confident that I had the best scenic shot of the week.